This article is about traditional Japanese gardens. For various gardens called "Japanese Garden", see Japanese Tea Garden (disambiguation). Japanese gardens (日本庭園, nihon teien) are traditional gardens that create miniature idealized landscapes, often in a highly abstract and stylized way. 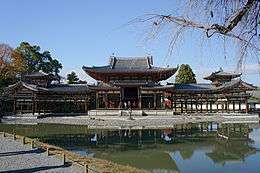 The gardens of the Emperors and nobles were designed for recreation and aesthetic pleasure, while the gardens of Buddhist temples were designed for contemplation and meditation. 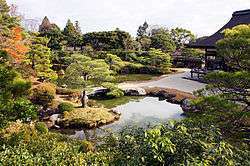 The earliest recorded Japanese gardens were the pleasure gardens of the Japanese Emperors and nobles. They are mentioned in several brief passages of the Nihon Shoki, the first chronicle of Japanese history, published in 720 AD. 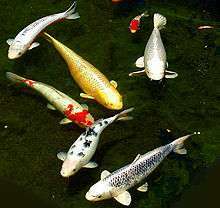 In the spring of the year 74 AD, the chronicle recorded: "The Emperor Keikō put a few carp into a pond, and rejoiced to see them morning and evening". The following year, "The Emperor launched a double-hulled boat in the pond of Ijishi at Ihare, and went aboard with his imperial concubine, and they feasted sumptuously together". And in 486, "The Emperor Kenzō went into the garden and feasted at the edge of a winding stream". The Chinese garden had a very strong influence on early Japanese gardens. In or around 552 AD, Buddhism was officially installed from China, via Korea, into Japan. Between 600 and 612, the Japanese Emperor sent four legations to the Court of the Chinese Sui Dynasty. Between 630 and 838, the Japanese court sent fifteen more legations to the court of the Tang Dynasty. These legations, with more than five hundred members each, included diplomats, scholars, students, Buddhist monks, and translators. They brought back Chinese writing, art objects, and detailed descriptions of Chinese gardens. In 612, the Empress Suiko had garden built with an artificial mountain, representing Shumi-Sen, or Mount Sumeru, reputed in Hindu and Buddhist legends to be located at the center of the world. During the reign of the same Empress, one of her ministers, Soga no Umako, had a garden built at his palace featuring a lake with several small islands, representing the islands of the Eight Immortals famous in Chinese legends and Daoist philosophy. 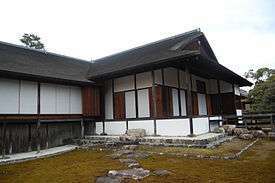 This Palace became the property of the Japanese Emperors, was named "The Palace of the Isles", and was mentioned several times in the Man'yōshū, the "Collection of Countless Leaves", the oldest known collection of Japanese poetry. 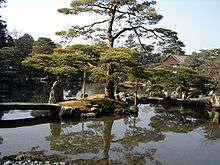 It appears from the small amount of literary and archeological evidence available that the Japanese gardens of this time were modest versions of the Imperial gardens of the Tang Dynasty, with large lakes scattered with artificial islands and artificial mountains. Pond edges were constructed with heavy rocks as embankment. While these gardens had some Buddhist and Daoist symbolism, they were meant to be pleasure gardens, and places for festivals and celebrations. 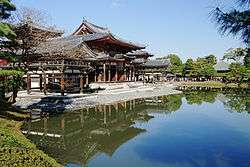 The Nara Period is named after its capital city Nara. 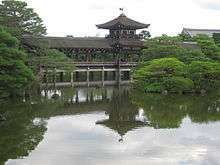 The first authentically Japanese gardens were built in this city at the end of the eighth century. Shorelines and stone settings were naturalistic, different from the heavier, earlier continental mode of constructing pond edges. Two such gardens have been found at excavations, both of which were used for poetry-writing festivities. The best surviving example of a Paradise Garden is Byōdō-in in Uji, near Kyoto. 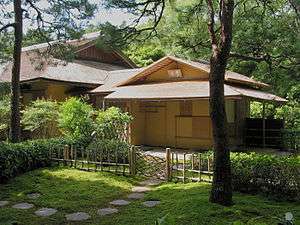 It was originally the villa of Fujiwara Michinaga, (966-1028), who married his daughters to the sons of the Emperor. After his death, his son transformed the villa into a temple, and in 1053 built the Hall of Phoenix, which still stands. The Hall is built in the traditional style of a Chinese Song Dynasty temple, on an island in the lake. It houses a gilded statue of the Amithaba Buddha, looking to the west. In the lake in front of the temple is a small island of white stones, representing Mount Horai, the home of the Eight Immortals of the Daoists, connected to the temple by a bridge, which symbolized the way to paradise. It was designed for mediation and contemplation, not as a pleasure garden. It was a lesson in Daoist and Buddhist philosophy created with landscape and architecture, and a prototype for future Japanese gardens. 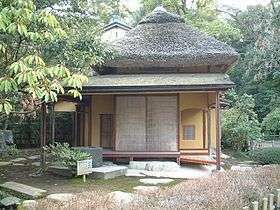 The Momoyama Period also saw the development of the chanoyu (tea ceremony), the chashitsu (teahouse), and the roji (tea garden). Tea had been introduced to Japan from China by Buddhist monks, who used it as a stimulant to keep awake during long periods of meditation. The first great tea master, Sen no Rikyū (1522–1591), defined in the most minute detail the appearance and rules of the tea house and tea garden, following the principle of wabi (侘び) "sober refinement and calm". 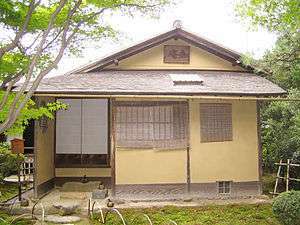 The Edo period saw the widespread use of a new kind of Japanese architecture, called Sukiya-zukuri, which means literally "building according to chosen taste". The term first appeared at the end of the 16th century referring to isolated tea houses. It originally applied to the simple country houses of samurai warriors and Buddhist monks, but in the Edo period it was used in every kind of building, from houses to palaces. 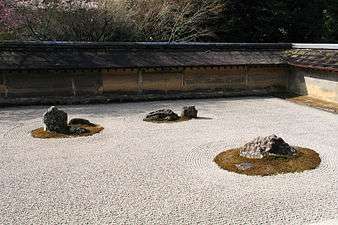 Most of the gardens of the Edo Period were either promenade gardens or dry rock zen gardens, and they were usually much larger than earlier gardens. The promenade gardens of the period made extensive use of borrowing of scenery ("shakkei"). Vistas of distant mountains are integrated in the design of the garden; or, even better, building the garden on the side of a mountain and using the different elevations to attain views over landscapes outside the garden. Edo promenade gardens were often composed of a series of meisho, or "famous views", similar to postcards. These could be imitations of famous natural landscapes, like Mount Fuji, or scenes from Taoist or Buddhist legends, or landscapes illustrating verses of poetry. 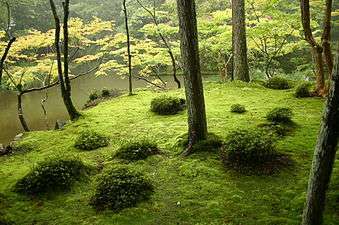 Unlike zen gardens, they were designed to portray nature as it appeared, not the internal rules of nature. The Meiji period saw the modernization of Japan, and the re-opening of Japan to the west. Many of the old private gardens had been abandoned and left to ruin. 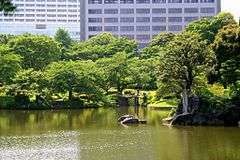 In 1871, a new law transformed many gardens from the Momoyama and Edo periods into public parks, preserving them. One of the well-known architects of that time was Ogawa Jihei VII, also known as Ueji. Chinzan-so in Tokyo in 1877. Japanese gardens always have water, either a pond or stream, or, in the dry rock garden, represented by white sand. In Buddhist symbolism, water and stone are the yin and yang, two opposites that complement and complete each other. 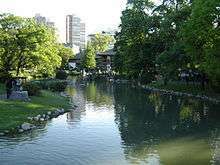 A traditional garden will usually have an irregular-shaped pond or, in larger gardens, two or more ponds connected by a channel or stream, and a cascade, a miniature version of Japan's famous mountain waterfalls. 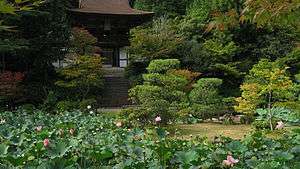 In traditional gardens, the ponds and streams are carefully placed according to Buddhist geomancy, the art and science of putting things in the place most likely to attract good fortune. The rules for the placement of water were laid out in the first manual of Japanese gardens, the Sakuteiki, or "The Creation of Gardens", in the 11th century (see "Literature" below). According to the Sakuteiki, the water should enter the garden from the east or southeast and flow toward the west because the east is the home of the Green Dragon (seiryu) an ancient Chinese divinity adapted in Japan, and the west is the home of the White Tiger, the divinity of the east. Water flowing from east to west will carry away evil, and the owner of the garden will be healthy and have a long life. According to the Sakuteiki, another favorable arrangement is for the water to flow from north, which represents water in Buddhist cosmology, to the south, which represents fire, which are opposites (yin and yang) and therefore will bring good luck. 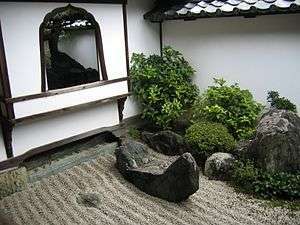 Rock, sand and gravel are an essential feature of the Japanese garden. A vertical rock may represent Mount Horai, the legendary home of the Eight Immortals, or Mount Sumeru of Buddhist teaching, or a carp jumping from the water. A flat rock might represent the earth. Sand or gravel can represent a beach, or a flowing river. Rocks and water also symbolize yin and yang, (in and yō in Japanese) in Buddhist philosophy; the hard rock and soft water complement each other, and water, though soft, can wear away rock. Such attention to detail can be seen at places such as Midori Falls in Kenroku-en Garden in Kanazawa, Ishikawa Prefecture, as the rocks at the waterfall's base were changed at various times by six different daimyo. The symmetrical and highly ornamental architecture of the Phoenix Hall in Byōdō-in Garden, Kyoto, (1052 CE) was inspired by Chinese Song Dynasty architecture. Japanese stone lanterns (台灯籠, dai-dōrō, lit. platform lamp) date back to the Nara Period and the Heian Period. Originally they were located only at Buddhist temples, where they lined the paths and approaches to the temple, but in the Heian period they began to be used at Shinto shrines as well. According to tradition, during the Momoyama Period they were introduced to the tea garden by the first great tea masters, and in later gardens they were used purely for decoration. 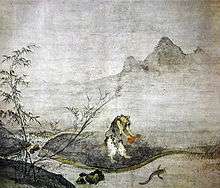 In the late 16th century, a new art was developed in the Japanese garden; that of ōkarikomi (大刈込), the technique of trimming bushes into balls or rounded shapes which imitate waves. According to tradition this art was developed by Kobori Enshū (1579–1647), and it was most frequently practiced on azalea bushes. It was similar to the topiary gardens made in Europe at the same time, except that European topiary gardens tried to make trees look like geometric solid objects, while ōkarkikomi sought to make bushes look as if they were almost liquid, or in flowing natural shapes. It created an artistic play of light on the surface of the bush, and, according to garden historian Michel Baridon, "it also brought into play the sense of 'touching things' which even today succeeds so well in Japanese design." Borrowing of scenery ("shakkei"). Smaller gardens are often designed to incorporate the view of features outside the garden, such as hills, trees or temples, as part of the view. This makes the garden seem larger than it really is. Viewpoint. Chinese gardens are designed to be seen from the inside, from the buildings, galleries and pavilions in the center of the garden. Japanese gardens are designed to be seen from the outside, as in the Japanese rock garden or zen garden; or from a path winding through the garden. Promenade or stroll gardens (landscape gardens in the go-round style) appeared in Japan during the Edo Period, (1600–1854), at the villas of nobles or warlords. These gardens were designed to complement the houses in the new sukiya-zukuri style of architecture, which were modeled after the tea house. These gardens were meant to be seen by following a path clockwise around the lake from one carefully composed scene to another. These gardens used two techniques to provide interest; borrowing of scenery ("shakkei"), which took advantage of views of scenery outside the garden, such as mountains or temples, incorporating them into the view so the garden looked larger than it really was; and miegakure, or "hide-and-reveal," which used winding paths, fences, bamboo and buildings to hide the scenery so the visitor would not see it until he was at the best view point. Edo Period gardens also often feature recreations of famous scenery or scenes inspired by literature; Suizen-ji Jōju-en Garden in Kumamoto has a miniature version of Mount Fuji, and Katsura Villa in Kyoto has a miniature version of the Ama-no-hashidate sandbar in Miyazu Bay, near Kyoto. The Rikugi-en Garden in Tokyo creates small landscapes inspired by eighty-eight famous Japanese poems. Japanese gardens also follow the principles of perspective of Japanese landscape painting, which feature a close-up plane, an intermediate plane, and a distant plane. The empty space between the different planes has a great importance, and is filled with water, moss, or sand. The garden designers used various optical tricks to give the garden the illusion of being larger than it really is, by borrowing of scenery ("shakkei"), employing distant views outside the garden, or using miniature trees and bushes to create the illusion that they are far away. Jardín Japonés de Belén de Escobar. ↑ These three quotations are cited in Nitschke, Le Jardin Japonais, page 30. ↑ Nitschke, Le Jardin japonais, pg. 36. ↑ See on the manual Kuitert, Themes in the History of Japanese Garden Art, pp 30-52. The quote is from Nitschke, Le Jardin japonais, pg. 36. 1 2 Nitschke, Le jardin japonais, pg. 120. ↑ Nitschke, Le jardin japonais, pg. 160-162. ↑ Roberts, Jeremy. Japanese Mythology A to Z. New York, NY: Chelsea House, 2010. Print. ↑ Michel Baridon, Les Jardins, pg. 492. ↑ Young, The Art of the Japanese Garden, pg. 24. ↑ Heyd, Thoams (2008). Encountering Nature. Abingdon, Oxen: Ashgate Publishing Group. p. 156. ↑ "Five Element Pagodas, Stupas, Steles, Gravestones". Onmark Productions. Retrieved 25 April 2010. ↑ Michel Baridon. Les Jardins. Pg. 475. excerpt translated from French by D.R. Siefkin. ↑ "Aquatic-oasis articles". Aquatic-oasis. Archived from the original on October 16, 2008. Retrieved 2009-02-26. 1 2 Young, The Art of the Japanese Garden, pg. 20. 1 2 Vincent, Gregory K. (2008). A history of Du Cane Court : land, architecture, people and politics. Woodbine. ISBN 0-9541675-1-1. ↑ Young, The Art of the Japanese Garden, pg. 84. ↑ Young, The Art of the Japanese Garden, pg. 118-119. ↑ Gunter Nitschke, Le jardin japonais, pg. 225. ↑ For a review of Sakuteiki and various translations in Western languages see: De la Creation des Jardins: Traduction du Sakutei-ki by Michel Vieillard-Baron. Review in English by: Wybe Kuitert in Monumenta Nipponica, Vol. 53, No. 2, Summer 1998, Pages 292-294 http://www.jstor.org/stable/2385689 See also Sakuteiki: Visions of the Japanese Garden by Jiro Takei and Marc P. Keane. ↑ Michel Baridon, Les Jardins, pg. 485. ↑ Nitschke, Le Jardin Japonais, pg. 42. Excerpts translated from French by DR Siefkin. ↑ Danielle Elisseeff, Jardins Japonais, pg. 39. ↑ Miyeko Murase, L'Art du Japon, pg. 183. ↑ Virginie Klecka, Jardins Japonais, pg. 20. ↑ Slawson 1987:15 and note2. ↑ Conder quoted in Slawson 1987:15. ↑ Slawson, David A. (1987). Japanese gardens: design principles, aesthetic values. Bunkyo-ku, Tokyo: Kodansha International Ltd. p. 15. ISBN 4-7700-1541-0. ↑ "Gardens". University of Southern Queensland. Retrieved 14 April 2014. ↑ "Japanese Gardens in the UK and Ireland — Compton Acres". Retrieved 2007-12-11. 1 2 3 4 5 6 "UK and Ireland Survey". Japanese Garden Journal. 35. September–October 2003. Retrieved 2007-12-11. 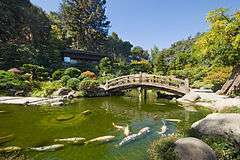 ↑ "Leeds - Places - Japanese Garden at Horsforth Hall Park reopens". BBC. 2009-08-27. Retrieved 2013-12-22. 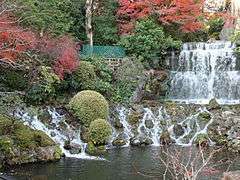 ↑ "Japanese Gardens and Where to visit them in the UK". 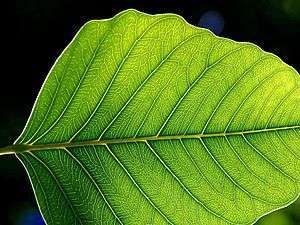 Homeandgardeningarticles.co.uk. 2011-05-26. Retrieved 2013-12-22. ↑ Eliovson, Sima (1971). Gardening the Japanese way. Harrap. p. 47. ISBN 978-0-245-50694-9. Red lacquered arched bridges are seldom seen in Japan, although they are often placed in Japanese-styled gardens in other countries. These are of Chinese origin and there are only a few in evidence in Japanese gardens. ↑ The Japanese Gardens. Dmtonline.org. Retrieved on 2010-12-25. ↑ "The Hotel". Kempinski Hotel Zografski Sofia. Retrieved 2009-11-06. 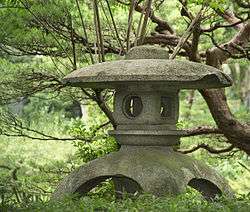 Wikimedia Commons has media related to Japanese gardens.